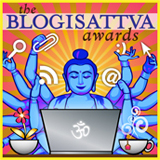 Applied Buddhism is a Finalist! What was sticking to the roof of my mouth like peanut butter was the question“why dukkha?” I know what you are going to respond, “Sumitta, we have dukkha because we have unwholesome craving.” But that is my point. Why do we have craving? Not just the Buddhist answers of “ignorance.” That requires a fully evolved brain.